If people measured corporate culture by smiling faces and enthusiasm, then Embark would most certainly be the alpha in the organizational pack. Need proof of our self-proclaimed success? Well, as we’ve stated in the past, our people are at the center of everything we do which, of course, explains why we use the best of the best for our recognition, culture survey, people management, and employee engagement platforms. But here’s the thing about running a successful enterprise with a satisfying culture and healthy competitive spirit -- the very moment you let your guard down, someone else comes along to steal that alpha leader crown. That’s why Embark isn’t one to rest on our collective laurels, wanting to make every step of the employee experience and journey as memorable, efficient, and productive as possible. As yet more proof of our enduring devotion to such lofty ideals, we partnered with Donut, an absolutely superb platform that helps Embark and Embarkers alike make every stage of the employee journey -- starting with onboarding and extending far beyond -- a meaningful, impactful, and essential foundation for our enduring success. While every stage of an employee's journey across an enterprise is important, the first 45 days with an organization is especially critical given that 20% of turnover occurs during the initial 45 days. Onboarding largely forms the ultimate success both the employee and employer will experience during the employment. Poor onboarding increases attrition, costs, and hurts the very culture that Embark holds so dear. Conversely, a strong onboarding process results in stability and retention, where nearly 70% of employees are more likely to stay with their employer for at least three years after a positive onboarding experience. In other words, onboarding isn’t to be taken lightly which, naturally, is where Donut enters the mix. Donut simplifies the different components of the typical onboarding process with their Slack integration, a platform that our team already lives on throughout the day. 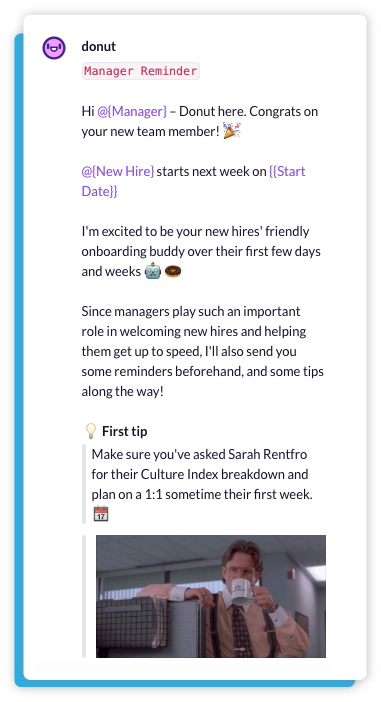 Having messages and interactions within Slack makes our onboarding process simple, streamlined, and incredibly convenient. Likewise, Donut’s intuitive dashboard helps our people management team easily manage and track the many moving parts of our robust and always evolving onboarding process. Given how many people we hire on a monthly basis, Donut’s onboarding solution is a saving grace for our team. In this first solution of the three that Donut provides Embark, tasks like setting up a new hire’s workstation, training materials, ordering business cards, and the countless other responsibilities that accompany a new member of the team are streamlined to remove the headaches and frustration from management. Their onboarding solution ensures that our newest Embarkers will have an amazing start, feel welcomed and important, and nothing slips through the cracks. 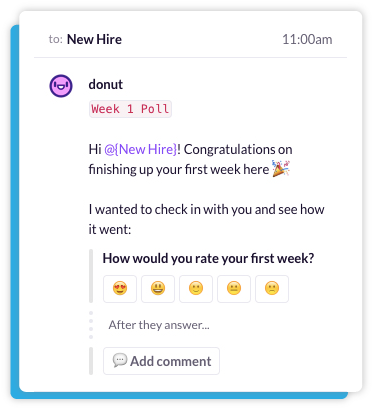 Although Donut is completely customizable, Embark uses a number of their helpful preset Slack templates that seamlessly roll it into the numerous steps that make up an employee’s initial 100 days with the company. Banking instructions for payroll, PTO requests, and even setting them up with an Embark buddy to show them company ropes are all automated and worry-free. Further, we use Donut’s platform to send our new hires little tidbits about our culture and vision, even mentioning particular books that other Embarkers and managers have enjoyed that shed a meaningful light on the Embark way. Likewise, Donut provides our newest team members with surveys to help us gauge the ongoing success of our onboarding process, giving us real-time feedback to identify any needed changes that may arise. Since nothing is ever perfect, such feedback is instrumental in ensuring that our onboarding process is constantly improving. Moreover, by taking action on that feedback, Embark demonstrates that their voice and opinion matter, having a tangible impact on the organization that helps steer our course and vision. Onboarding is obviously instrumental to our success today, tomorrow, and well down the road, but so is our existing team. However, Donut doesn’t leave current Embarkers in the lurch, especially through a feature we call Lunch Bunch within the second Donut solution we utilize on a daily basis. With Lunch Bunch, Donut pairs two or three existing team members every month who haven't yet interacted through Slack, perhaps for lunch, a cup of coffee, or, naturally, a donut breakfast. This is yet another way we foster teamwork, culture, and a sense of camaraderie by deepening relationships within Embark that might otherwise remain in the peripherals of our operations. Lunch Bunch is particularly powerful in connecting Embarkers from our ever-expanding offices, maybe pairing someone in our Denver office with an Embarker in Austin. In this case, a simple Slack Hangout goes a long way in reducing the impact of geography and our growing footprint on our collective sense of team. Moreover, people that have been with Embark for a while get to share their insights and advice for finding success within our company as well as areas outside of working life. Lunch Bunch eliminates information silos and helps Embark establish a collective wisdom that everyone benefits from. The third part of Donut’s solution focuses on employees that are changing positions within the company which, as anyone familiar with those circumstances can attest, is almost as nervewracking as joining a new employer altogether. Sure, the surroundings might be familiar, but a new role with bigger, often more significant responsibilities can make even a seasoned veteran sweat a bit. Thankfully, Donut helps management, as well as those Embarkers changing positions, make the transition as smooth, efficient, and comfortable as possible. Once again, the Donut platform maintains detailed lists and guidelines for the employee’s first 100 days in the new role, ensuring HR, managers, and the Embarker miss nothing along the way. Beyond administrative to-do’s or more rigid training modules, Donut also helps us Slack more wide-ranging recommendations, such as a book or podcast, that will help them further develop within their role and long-term careers. This is an ongoing process, a component of training and development that evolves with the employee, management, and Embark itself. Everything we’ve mentioned thus far about Donut makes it an important piece in the Embark puzzle, creating a cohesiveness to our culture and workplace that begins with onboarding but extends into every moment of an employee’s tenure with the company. However, we would be remiss if we didn’t again emphasize the many benefits that Donut’s automation provides us, HR and managers in particular. Donut saves us significant time, resources, and stress by eliminating vital but tedious tasks, allowing us to devote them to other essential areas of our operations. Ultimately, Donut adds tremendous value to the entire organization by handling many of those repetitive tasks, now allowing our individual team members to collaborate, innovate, and grow. As Embark expands, it’s absolutely critical that we maintain who we are, our unique perspective, and the very Embarkness that has propelled our success in the first place. Donut makes that process simple but powerful, from the very moment a new hire walks through our door to the exciting moments when an employee takes on a more prominent role within our organization. With Donut, Embark will always be Embark, and we can’t think of a single thing that delights us more to say.